New Delhi, 18 July 2017: National Programmme for Control of Blindness (NPCB) has been re-designated recently as National Programme for Control of Blindness and Visual Impairment (NPCB&VI). 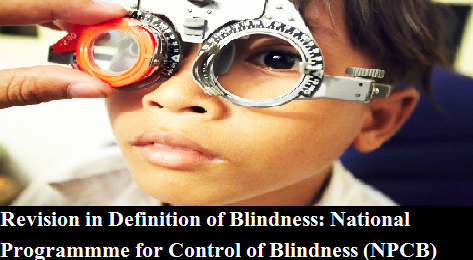 Further, the definition of blindness under the National Programme for Control of Blindness and Visual Impairment (NPCB&VI) has been modified in line with the definition used under the World Health Organization (WHO), i.e., ‘presenting distance visual acuity less than 3/60 (20/400) in the better eye or limitation of field of vision to be less than 10 degree from centre of fixation’. The Minister of State (Health and Family Welfare), Smt Anupriya Patel stated this in a written reply in the RajyaSabha here today. National Programmme for Control of Blindness (NPCB) has been re-designated recently as National Programme for Control of Blindness and Visual Impairment (NPCB&VI).